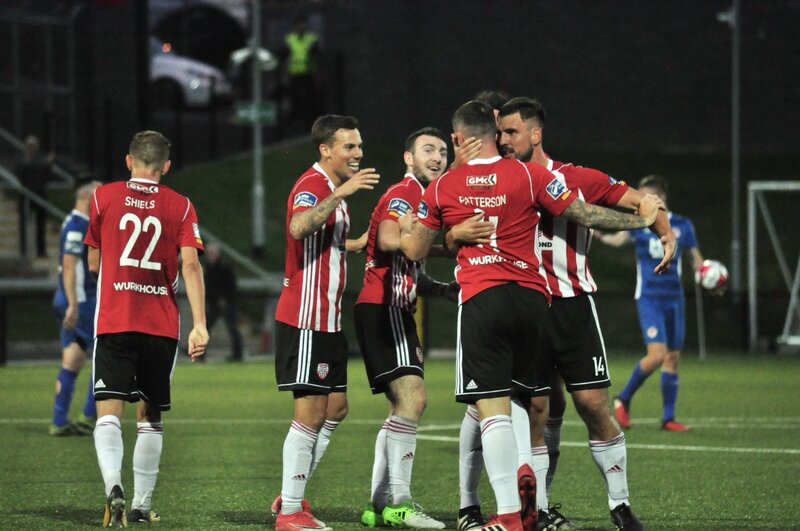 A dramatic game at the Brandywell that saw three red cards but City take the three points. Ally Roy struck in the 4th minute to give the home side an early advantage. The Saints dominated the rest of the half and got their equaliser through Ryan Brennan as the City defence failed to deal with a cross. In the second half, both sides were in search of a winner and the points looked to be heading back to Inchicore when Ben Fisk gave away a penalty in the Derry box. It just wasn’t to be though for Pat’s as Ger Doherty saved Killian Brennan’s penalty and the scramble that followed was also fruitless. City got their second wind and substitute Rory Patterson made no mistake with his finish as the Brandywell faithful erupted in celebration. St. Pat’s pushed for a late equaliser but at a throw-in in the Derry half, a ruckus developed which resulted in Byrne and Bermingham dismissed for Pat’s, whilst Toal got his marching orders for Derry. A tense 5 minutes of injury time followed but Derry hung on and bagged the three points.